Fill out our simple form and get quotes from local Canapés. Canapés are a fantastic addition to any event. What better way to welcome guests than to offer up delicious bites with their bubbles, booze or brews. For weddings, events or parties of any size these are the perfect pre-meal tantalizer or transitional activity. Have a look at our canapé suppliers to see what’s on offer. Canapes are one of our specialties. Whether it be for a corporate event, wedding or private event; just let us know your requirements and we will meet your needs and serve them too! We can create canapés for any occasion from basic to premium! Vegetarian and meat lovers are all catered for! An array of canapés for any occasion whether it be a corporate event or private event. We can meet your needs and deliciously serve it up! When 'first impressions' really do matter, then set the standard with our delicious, hand made canapés, lovingly infused with flavours & colours and elegantly served to your guests. If you don't know, it's no problem. The caterer will be able to provide guidance on this. Canapé caterers can tailor your canapés for any event; big or small, day or night, formal or informal; they are a versatile choice. Weddings can be a long day for you and your guests, canapés offer a little nibble throughout the day and are a wonderful way to break up your event. Smaller scale events or evening events also work well with canapés, perhaps at an event where food will not be served. 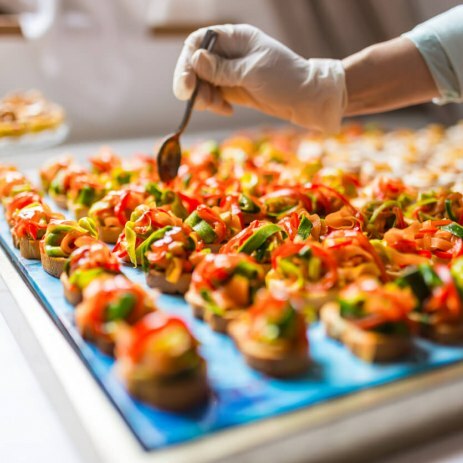 You can choose your canapè menu, be it toasts, tarts or turbot, plus if you have a themed event then your party canapés can easily reflect this too.